These beautiful, handcrafted wooden embroidery hoops will give your embroidery art the frame it deserves. Auburn Hoops has several different decorative shapes available in different colors for your hoop art. I recommend hopping on their mailing list because these hoop frames sell out quickly! There’s nothing worse than misplacing your needle as you stitch and that’s where fun needle minders come in! I love this one that you can find on Sublime Stitching’s website. It makes a perfect little stocking stuffer. 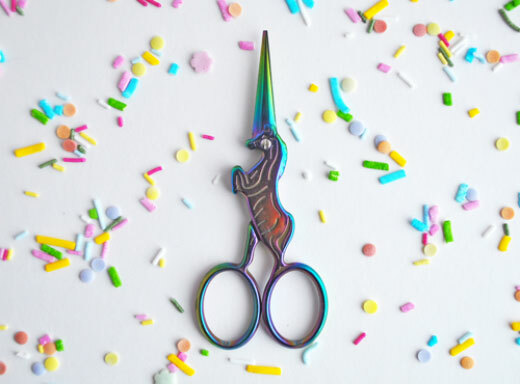 It’s always useful to have a small pair of embroidery scissors handy, so why not get something with a little style? I love this super cute unicorn pair available at Cloud Craft’s website. As someone who loves hand embroidery, I become rather obsessed with embroidery floss and fabric. (You too?) Colour and Cotton’s monthly hand-dyed thread club would be a treat for any stitcher! Once you have all this wonderful thread, you’ll need a place to organize it! I use this simple system to organize my embroidery floss, though there are many other options available at your local craft store. I don’t know where I’d be without my OLFA cutting tools. I regularly use their mats and rotary cutters to trim fabric to size before I embroider it and they make the process a breeze! My sit-on embroidery frame by Hardwicke Manor is hands down one of my favorite embroidery tools. I can tell its durable European craftsmanship will last for years to come. But most of all it allows me to stitch hands-free without holding my neck at an awkward angle. I like to use mine so that my embroidery is almost at eye-level and love that it saves my wrists and neck from aching when I stitch for long periods of time. 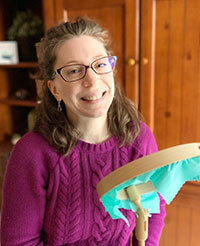 Just put the paddle under your thigh to hold the hoop steady and stitch away! I purchased mine from Needle in a Haystack’s online store - if you’re in the USA, just look for the Hardwicke Manor "Fanny" Frame on their website. I’ve been rather intrigued with Sashiko (Japanese folk embroidery) and its mending techniques and I think there’s something beautiful about taking a favorite worn-out piece of clothing and giving it new life through decorative mending. The book Mending Matters: Stitch, Patch, and Repair Your Favorite Denim & More by Katrina Rodabaugh could be a wonderful way to incorporate stitching into your everyday life in practical ways. Whether your preference is hand embroidery or cross stitching, make sure to check out Colour and Cotton’s hand-dyed fabric. They have a huge variety of colors whether you’re looking for linen, aida or evenweave. Now the only thing left to do is start stitching! Need an embroidery pattern or kit? Swing by my shop and pick something up! What’s a favorite tool or stitching supply you can’t live without? Share it in the comments below!